This website provides GOSAT products and related information to general users and researchers. Please click the login link at the top of this page and log in with the registered account (e-mail address) and password. A list of accessible GOSAT data products will be displayed. If you do NOT have a user account, please complete the registration first from "User Registration" page . NOTE for GUIG users: Your GUIG account continues to be valid for GDAS. No registration is necessary. For more detailed instructions, please refer to the GOSAT Data Archive Service operational manual. ATTENTION: Please be sure to read the GOSAT data policy carefully before utilizing GOSAT data products. Note: GOSAT-2 products are not available on this website "GDAS". ANOTHER website "GOSAT-2 Product Archive" is scheduled to be opened soon to release GOSAT-2 Level 1 product after August 2019, and Level 2 product after November 2019. 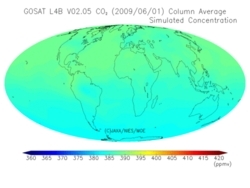 The Greenhouse gases Observing SATellite (GOSAT) Project is a joint effort promoted by Japan Aerospace Exploration Agency (JAXA), National Institute for Environmental Studies (NIES) and Ministry of the Environment (MOE). NIES established NIES GOSAT Project in April 2004 for the research and development with respect to GOSAT "IBUKI".